Encouraging Bible Verses for Women. You know that feeling of exhaustion that hangs heavy on your chest? It steals your joy and energy. Yes, that’s it. I’ve been there and as I searched God’s Word for Encouraging Bible Verses for Women, I wanted to share them with you. 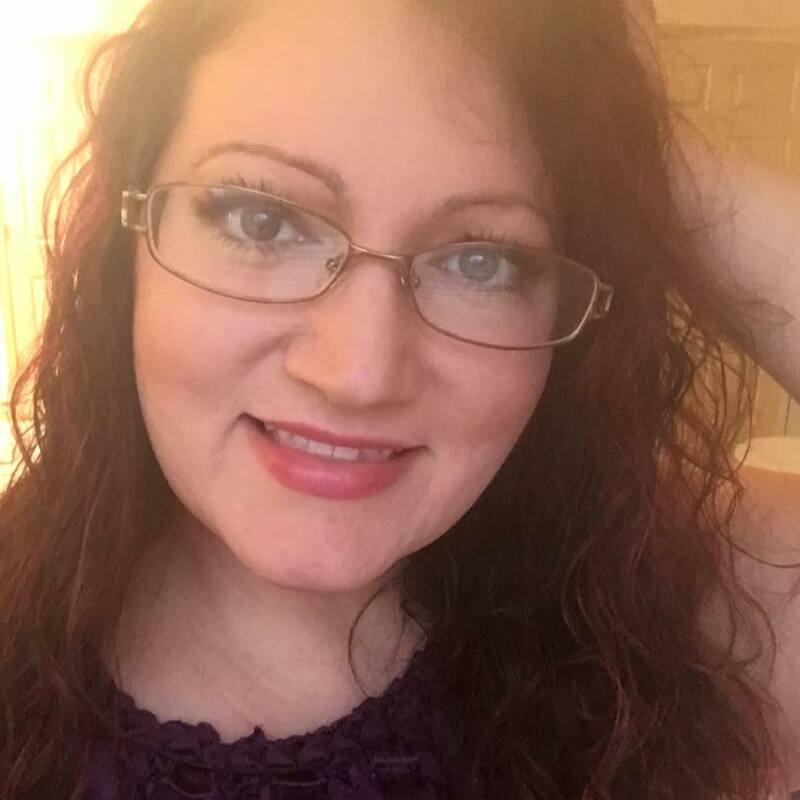 Amidst the hustle of trying to adjust to living in another country, homeschooling 2 kids, managing the home, and my part time job – I’m exhausted. Barely keeping my head of above water some days. Working hard. Going to bed exhausted. Waking up weary. Putting on the smile and cheerful attitude so others don’t see, because – after all- I’m the christian and should not feel this way. And feeling ashamed about these feelings. Which makes it worse. *Is something getting in the way of me hearing God’s voice and resting in His arms? *Has my daily time with God become more routine instead of deep passion? Diving back in with a fierceness in my soul I cranked up the worship music and wept. Skin on the cold tile. Tears pooled beneath me. I cried out for renewal!! Praying and worshipping God. Telling Him all I need is HIM. He is enough. I begged Him to change me. I dragged out my truth journal from it’s hiding spot and wrote out my ugly feelings that overwhelmed this momma’s heart. I then wrote out the truth over myself, my heart, my feelings and my life. Making sure to add Scripture and to let my heart and mind settle on those verses of truth. 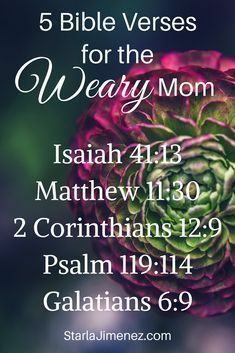 So I share these Encouraging Bible Verses for Women with you in hopes that when you grow weary, tired or exhausted you have them bookmarked already. Turn to them quickly and let God’s Word settle on your heart to give you rest and renewal. There is just something that soothes my soul to know that God holds my hand. He doesn’t leave me. His faithfulness doesn’t waver during my weakness. This verse reminds me that whatever I may go through here on earth… death of a beloved, betrayal, set backs, exhaustion etc – all of it is light in comparison to Eternal Glory and the reward that I have in Heaven. God’s power is made perfect in weakness. It’s not about me, what I can do or what I can not do. It’s about Jesus and His story of rescuing me from sin. It’s about Jesus! He is enough. I remind myself of this over and over again. I allow my heart to settle on this. God is our refuge and our shield. My hope is in Him and He is enough! This verse helps me to keep my perspective in check. God wants to be my refuge and strength, but I need to not give up. I need to keep pressing forward. I need to keep doing the good work. 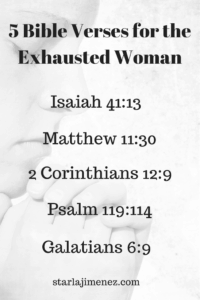 The next time you find yourself feeling exhausted, remember these encouraging bible verses for women – asking God to guide your heart and thoughts. Remember your identity in Christ! Remember God sings over you and He loves you with a passion. You can do this – momma – wife – daughter of God. You can do this, because God has you. What bible verses do you run to when you are weary, exhausted or just done and need God to rescue you? Praying His strength continues to sustain you, Starla. The one verse you shared from 2 Corinthians is one that has spoken to me many times. His grace is greater in our failures, our exhaustion and in our weakness! Psalm 199 & Galations 6 are two of my favorites! Thank you so much for this! Not only did it provide some encouragement to me as a currently exhausted woman, but it also gave me a verse that I needed for a post that I'm working on.